For easy and convenient maneuvering of any casket, our Church Truck sets the standard. 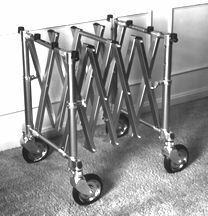 Its distinctive accordion x-design allows this exclusive product to be expanded or contracted into four different positions, adjusting to most size needs. Made of sturdy anodized aluminum tubing, the Hepburn Superior Church Truck will provide you with years of dependable usage. 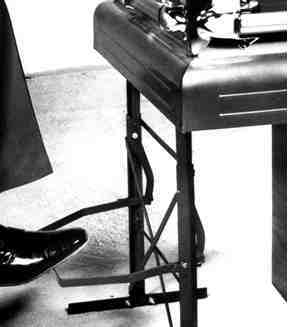 It is a "must have" for any funeral home. Made of strong, rectangular, aluminum tubing, the Model 87-H Cemetery Church Truck features a protective anodized finish that keeps the truck looking bright and shiny-new as well as making it easy to clean. 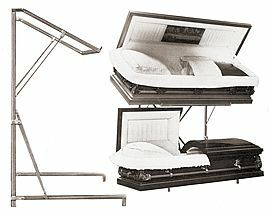 The stable x-frame undercarriage and rubber rests help to secure the casket. Large 8 inch pneumatic wheels rubber tire roll easily over grass and rough terrain with quiet dignity. There are four swivel wheels for greater maneuverability and two wheel locks. When moved without a casket a special built-in handle allows the truck to be pushed, pulled or carried. The Model 87-H Cemetery Church Truck locks into four positions, allowing a wide range of casket sizes to be displayed with one truck. The additional length also increases the stability and makes an attractive appearance. The Model 87-H Cemetery Church Truck has the added convenience of four fold-out handles. Use the handles to navigate sills, curbs and other obstacles or for assistance when climbing stairs. Comes in onyx, blue, clear, bronze or gold finish. 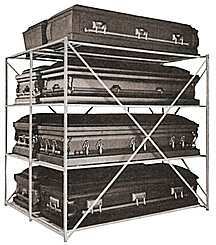 Ideal for use in church, synagogues, funeral homes and mortuaries. 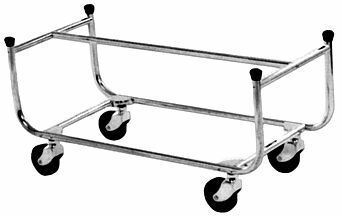 This cart is constructed of sturdy anodized aluminum tubing for a long lasting like-new appearance. Large six inch wheels roll with ease over rough surfaces. Six rubber tips will hold casket solidly in place. Shipped knocked down, easy assembly. Dual Duty Truck works showroom truck and utility truck. Polished aluminum frame is exceptionally strong. Looks like new for years with minimal maintenance. Rubber tips hold caskets or rough boxes firmly in place. 5" ball bearing wheels. Extra-long and wide wheelbase provides exceptional stability. Performs equally well as a utility truck. The strong, aluminum frame will keep its polish for years with a minimum of maintenance. Rubber tips hold caskets or rough boxes firmly in place. 5" ball-bearing wheels. All steel enamel finish. lifting capacity 600lbs. Pressing down foot bar raises casket from 18" to 22". Locks at maximum height. Shows the interior of caskets without rolling one out from under the other. Can be used for storage in very small areas. 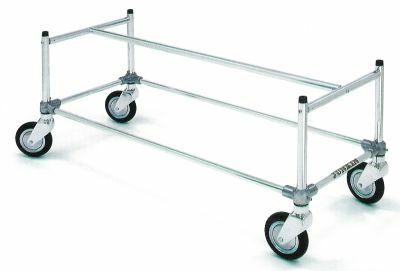 Units are made of sturdy , electrically welded steel tubing, zinc plated permanent finish. Attractive cover of heavy duty quilted fabric to protect caskets from inclement weather. Outer shell is filled with cotton batting. Cover is lined with white cotton. 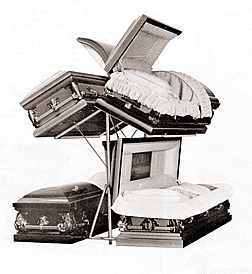 Save space - store 2 or 3 caskets in same area as one. Safe with no wiggle or wobble. All steel construction will support 2 tons. Forest green enamel finish. 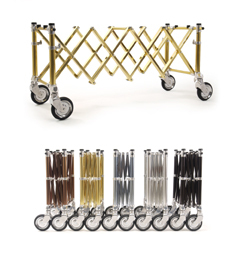 20 individual metal rollers on each tier allows casket to roll into place easily and safely. These casket covers are 2 mil clear polyethylene with all edges bound. 90" x 33 1/2". Individually packed. C222/10 DOUBLE POLISHED 4 MIL. Casket veils have been used as religious symbols and to cover precious items. 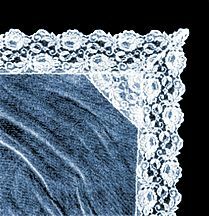 Veiling adds dignity and commands respect for the deceased. Veils are full cut and well tailored. 4" fringe. Available in Black, Ecru, Eggshell, Gray, Rust, Blue, Navy, Orchid, Pink, Poppy or Wine. Same case can accommodate infant to seven year old child. Heavy duty construction to last many years. Made of sturdy wood, covered in Boltaflex. All corners are reinforced with metal. Permits transporting bodies in discreet manner without curiosity or comment. Convenient practical dependable, these are hermetically sealed. Guaranteed air and water tight. 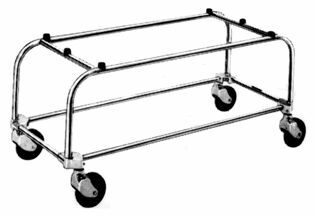 Steel utility case is ideal as an economical shipping case and acts as a sealer when used with any casket. For use in handling difficult cases, protects against odors, drainage and exposure. Channeled rubber sealer in lid creates an air-tight seal when pressed onto the precision made case. Screws provide a permanent seal when needed.